Umit Unal’s latest collection features their dark and edgy style blended with elegance and sophistication. The colors are navys, greys, and whites, which are highly wearable and able to incorporate into any wardrobe. The texture and silhouettes used in materials such as linen and silk give a rugged edge while small details, such a pleats, add an classic flare. 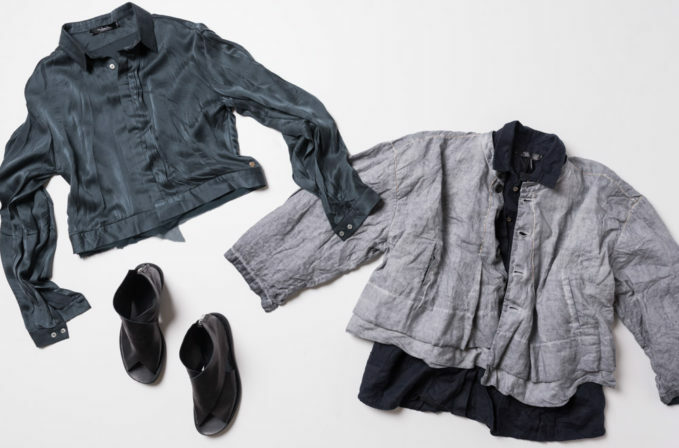 The Umit Unal teal blue silk pleat top or navy blue linen top can be layered with their grey linen button-up jacket. Officine Creative shoes are a blend of Italian craftsmanship with a modern aesthetic. Wear with Officine Creative black leather sandals to complete the outfit.